I'm curious as to the numbers for the C1400 in the US. Maybe its because beauty/performance is in eye/wrist of the beholder and in this case i'm the beholder, but i've never gotten my head around why the Cal1400 isn't a huge seller in the cruiser segment, relative to MG's presence here in the good ol' USA. I've ridden most of the variants from its competition and it just never comes up short in overall fun. That is not to say that by the specs it is always a clear winner, because many bikes have more this, less that, etc.... But as a total package, it just flat delivers on quality, passion, beauty (totally subjective), comfort, etc.... There is some really good stuff out there from the big boys and excellent choices abound, and to be honest the Indian Chieftan Limited is a gorgeous temptress. I guess the Guzzi footprint is too risky to the masses, and probably isn't even known much outside of the faithful. I think the problem is me. Its like my dad said, "Don't let the facts get in the way of a good story!" Maybe i'm too much the optimist, thinking that if more people would/could give it a shot, it would be a no-brainer. Ride with your kids...its cheap therapy for both of you. I have one but I don't think it's particularly beautiful. I bought it because I love the engine. However, a surprising number of strangers have approached me to compliment the bike. Women and men over 50 seem to really appreciate the bike from an aesthetic standpoint. I have a few friends with souped up Harley's and Victory's. They all have a healthy respect for the bikes performance based on a few spirited rides we've taken together. The bike has weaknesses but they are ones that are endemic to all cruisers. It needs better rear shocks with more travel. It has quite a bit more ground clearance than most cruisers but it could use more. The front fork is a little harsh. The floorboards aren't long enough. I think the 1400 suffers from the same problems as every other Guzzi. Most people have never heard of Guzzi. If they have they complain about dealer support. Guzzi has had some well known fiascos lately with the flat tappet deal and assorted nuisances. I love a lot of things about my Guzzis. I like the motors, the chassis, the overall performance and running gear. But to me the Cali comes up short on so many things it didn't remain in contention long when I was considering a large tourer. * Cornering capability is about the last thing people care about with most large tourers, and it's not like the competition is struggling. So what if the Cali 1400 has a few more degrees of lean if, for most people in the segment, a lowered Electra-Glide still has more degrees of lean than is needed/wanted. * Hp and the ability to rev the motor a little bit more is just not a priority in this segment. Buyers in this segment traditionally want fat effortless torque as the number one priority, and if they do want hp then they want a hot-rodded bike with a lot more than 84 rwhp (which btw, most of the segment makes more than that now with pipes and a tune), hell the current Softails with the 114 are dynoing at ~82 rwhp stock, but with ~111 ft. lbs of torque compared to the Cali's 73 torques! Couple that with VALVE ADJUSTMENTS? Puh-leeeze, the vast majority of this segment has hydraulic lifters which leads to a "change oil and ride" attitude. Now speaking personally as someone who loves Guzzis, and is glad to have two in the garage, the 1400 fell short on a few of those things to me, and more. I don't actually like the looks of the bags, the one model that has the best looks forces you to go with spokes, and I actually got more bike and accessories for less money with a Harley. Go figure. I think potential buyers prefer the "original" - Harley or Indian with more torque. -2002-2004: V11 Le Mans "Grigio Titanium"
-2004-2011: V11 Le Mans "Rosso Corsa"
I guess the Guzzi footprint is too risky to the masses, and probably isn't even known much outside of the faithful. Most motorcyclists, and especially the casual cruiser riders, aren't what we would call real knowledgeable enthusiasts. In that crowd, Guzzi has a problem with name recognition. People just don't know about the brand. Add to that a super-spotty dealer network, and there is little to no improvement with that issue. It happens often. When I'm out riding and stop somewhere there are cruiser riders about, someone will inevitably ask me "where is the nearest dealer?" and "who services those around here?". When I say the nearest dealer is 200+ miles distant and I do most of my own service work, their eyes glaze over, and they wander away. Among enthusiasts who know the brand and the bike, I think the Cal14 is appreciated for its engine, but the styling is a little chunky, its wheelbase is too long, and its weight it too high. Had Guzzi chosen to make the Cal14 on a 60-inch wheelbase, weighing 600 lbs, with fewer gimmicks in the styling, I think it would be better embraced by the moto enthusiasts who aren't traditionally into cruisers. My opinion is the Cal14 is a deadend model line. If Guzzi hasn't already killed it, they likely soon will. A quick perusal of Cycletrader this morning found 159 model year 2018 Guzzis listed. Three of them were California 1400s. A Touring and two Eldorados. *editing to add: My next bike will likely be a big cruiser. I've been wanting a Cal14. I've been trying to decide Audace, Eldo, or Custom. All three would need modifications to suit me. Hate the paint on the Audace, would prefer cast wheels on the Eldo. If I could find a nice blue Cal14 Custom I might pull the trigger. But with the closure of the Tulsa dealer, my interest is waning. There are some deals on used, low mileage Indian Chiefs and Chieftains. I like their looks, they have a lot of aftermarket support, and I have a dealership 20 miles away. I dunno, I really don't know. So there's 2-3 issues here. 1. That's a minimum deficit of 22% less torque and potentially as much as 30% less torque. 2. Harley and Indian dealers all sell pipes/tunes etc. that will increase those numbers AT LEAST 10% putting the hp = to or above the Guzzi while furthering the relative lack of torque. So for riders who are used to and/or like motors that turn low rpm - they are USED to running around in the 2-2.5k range and as we know the Guzzi is happier much higher. That's a different feel. That's enough for most people to pass regardless of any real world performance. and maybe im going WAYYYYYY off the deep end... but maybe water cooling?. I think that unless the water-cooled versions of the Harleys get more popular that would just be further tech death in this segment. The time might come, but face it, customers like this have been woo'd with much more hp/performance with water-cooled bikes from other brands and they just never caught on - other than say a Wing.... I don't think that's the answer either, though it might be forced upon everyone eventually. Anyone who enjoys spirited riding cares about cornering clearance. The new Harley's make a lot of torque but you have to short shift them and they will not keep up with a California from 60-100mph over a mountain road. It takes a pretty good rider just to keep the Guzzi in sight after a couple miles. I have a friend with a Victory Cross country that's been re-mapped and has aftermarket mufflers. On paper it has more hp and way more torque than my 1400. We've probably raced from 50 to 100+ at least twenty times and the Victory has never been in front for more than the first couple seconds. A 1400 Custom does a mid 12 second 1/4 mile. a 2018 107 engined Harley is over 13. On paper it doesn't seem like much but it's 12-15 bike lengths in 1/4 mile. It's not even close and the difference is more pronounced when you're riding at speed for any distance on a curvy road. Here's the problem; how many people want to flog a 700lb cruiser all the time over mountain roads, want it to be quick as well as fast, want good ground clearance, want air cooling and traditional cruiser design? Not many. If they do they buy a Diavel or something else that's water-cooled. It's a niche bike in a niche market by a niche brand with no support. Anyone who enjoys spirited riding cares about cornering clearance. Too general unless what you mean is those who want to push machines of this size past the average limits. Which is the vast minority of people who ride these bikes - OR - RIDE THESE BIKES this WAY (as they may have other bikes for that). EXACTLY - VERY VERY small minority. I largely agree with Rocker. The small dealer network is big culprit. First, there isn't much recognition regarding Guzzi and their products. So many riders have never heard of them. Second, even if rider likes the bike, he may not be comfortable with the small dealer network for warranty and service. Another element is that the Guzzi line up of small blocks and 1400 cruiser doesn't match up with the traditional Guzzi rider that is more inclined to a sporting bike and has some experience with quality problems and warranty service with newer bikes. Having said that, the Griso is still available but is an older product. But sport touring was a big element, and nothing in the Guzzi quite matches that. I'm probably repeating myself but this is a good thread in regards to Harley and Moto Guzzi, which I love both bikes equally. I switched from Harley to Guzzis a few years ago when Lisa and I decided we had ridden enough after several fatalities in our area a few years ago, and sold the electric glide. In the event, for what ever reason I felt the need to rid myself of the 1400 tourer I would definitely go back to HD, they are just great sensible bikes with endless support and after market add on's. You've hit on something here. Guzzi is drifting away from it's traditional market and customer. 950-1200cc "mid-sized" bikes that were simple, elegant, and out performed their spec sheets. Griso is the last of those bikes, without any replacement in sight. There is a huge hole in the current Guzzi lineup where a very large number of the people on this forum reside. I believe the current California would've been a much bigger success if they'd made it shorter and lighter. The American big cruiser market is a tough nut to crack, and you're not going to do it with a plastic-fendered machine with a high-revving engine from an unknown company with no dealer or aftermarket support. count me in the minority of people who love to flog a 700lb cruiser and change their own oil and adjust valves. it flat corners like no other cruiser. my victory was sporty compared to my harley, but this 1400 puts them both in the ditch. i find the power just right, it has Ago pipes, but with baffles so the power is not raised. it just flat works and they described some of the old guzzis as like freight trains, when you rip into this one, it sure seems like a run away train. the down side is that i warped the rear rotor on some mountain roads (warranty luckily) and the metzler 888s only went about 6k miles. it eats the miles with its cruise control and stability. in 11,000 miles it had only that rotor which was really my fault and the weird electrical harness thing under warranty. this bike has its own catagory: sport cruiser. so, with that said, yes, since i ride a guzzi, i am strange anyway and realize i am living dangerously. and, i know i am a niche of a niche of a niche rider, but i say thank goodness guzzi made this thing. i have mine, so i don't care if they don't sell many or if most riders don't understand it. i'm keeping mine. count me in the minority of people who love to flog a 700lb cruiser and change their own oil and adjust valves. There are what? A couple dozen of us in the USA? LOL! i did say, a niche of a niche of a niche. the victory i had was a kingpin tour, so i don't know about the 92 bikes, but it handles pretty well, the engine was very powerful, but signed off at about 4,000 rpm. 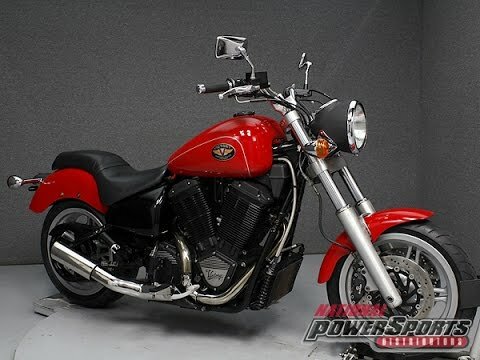 the v-rod was not a sport cruiser, it was a magnificent motor in a very compromised frame. but, these nit pics aside, i do agree with you that it is a very small niche, oh, did i say that already? At the same time, like everyone else said, brand recognition plays a huge role. I've been around and talking to people about Guzzis since I was a kid, and I can literally count on one hand the number of people who had ever even heard of the brand, before I brought it up. I think the 1400 T would appeal to me if my feet were under me and not in front. I came close to getting one on several occasions. Never pulled the trigger and have gone lukewarm about it. I am impressed that the newer Guzzis seem to be pretty reliable and don't have reoccurring problems. You can remove the heal shifter get your feet in about the same position as with mid pegs and still have room to move your feet around. V92SC - well regarded by the moto press. Sales flop. VRSCR Street Rod - the sporty V-Rod. When working last year at Americade for a day in the demo tent one thing became very apparent. As riders of other big cruisers returned from the demo ride I heard, over and over again, comments that let me to conclude that they were riding the bikes MUCH too low in the rev range. They were riding the 1400 like their Harley's and we all know that doesn't work. I started to mention to guest riders PRIOR to their ride that they would have a MUCH better experience keeping the bike around 1K higher than they would on their hogs. When I was working Triumph demo days years back and the 1600 Thunderbird was just out-same thing. That motor liked to be 1K over what a H-D wants to be at. Most of us here are involved to a great degree with our machines. Working with the general riding public I can assure you that's not always the case. In fact, it's usually the opposite. ...comments that let me to conclude that they were riding the bikes MUCH too low in the rev range. They were riding the 1400 like their Harley's and we all know that doesn't work. I started to mention to guest riders PRIOR to their ride that they would have a MUCH better experience keeping the bike around 1K higher than they would on their hogs. 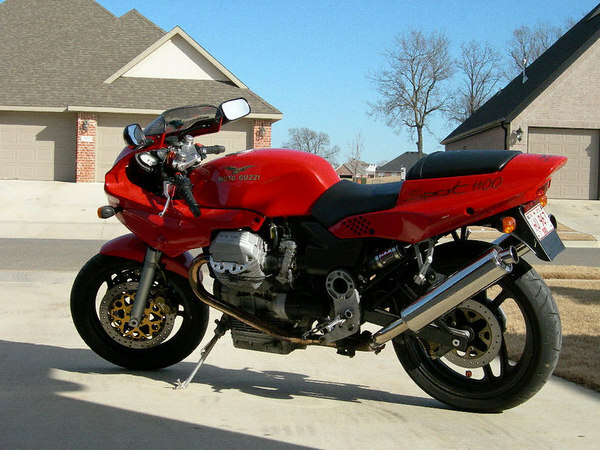 When I worked at a Triumph/Ducati/Moto Guzzi shop 20-years ago, we sold a customer a new 1998 Ducati Supersport 900FE. Not long afterward, I was talking to him and he wasn't happy with the Ducati. He complained that in 6th gear at 55mph, the bike had no accelleration. The customer had been riding an H-D Sportster XL1200S. A sporty Sportster, but totally different engine character. I took this customer on several rides, explaining that it was OK to ride around in 3rd, 4th, and 5th gears. That he needed to keep the RPM in the 4000-6000 range for more enjoyable results. In the end, my coaching did no good. He didn't own the 900FE very long. He just couldn't adapt to the high revving Italian V-twin and its relatively tall gearing. So, yeah. The Cal14 may out handle and out perform other big cruisers in just about every way. BUT, the big cruiser customers are not buying bikes for that. They're just not. When the most popular mod to a new cruiser it slam it to the ground and make is as low as possible, how can Guzzi honestly believe Cal14's handling advantage will be an important feature and benefit to that customer? I have no idea "why not the 1400"
But, if we're to have a robust discussion - then I suggest we post up some visual aids. I have though over the last three or four years steered many of my cruiser Harley Indian enamored friends to the California. Not a criticism of them, but they we're not willing to step out of the mainstream and take a risk on a bike they perceived as being unreliable without strong dealer support. As I think most in wild Guzzi would say, the lack of dealer support is real, but reliability has been mostly spot-on for Moto Guzzi motorcycles the last 8 to 10 years, and while that's not a particular issue for those who know, the impression that many have is that an Italian bike is going to be unreliable. That was my (completely uninformed and incorrect) opinion when I bought my first Moto Guzzi which was a 4 valve 2007 Griso. But it was only $4,000 and I was willing/able to work on it. The day I decide I want a large touring bike there's only one that would consider. -Great thread with plenty of warranted likes and dislikes. For me my 2014 Touring checked most of my boxes and still does. How much power and torque does it have ?? ....enough to keep me happy. Why the comparison numbers game. I had a 2005 GSXR 750 and it was way more bike than I was capable of and in reality more than probably 95 percent of people that rode them. I used to get Sport Rider magazine and month after month of the comparisons of times and horsepower by nominal amounts. Purchasing based on this is defanately not important to me. -I'm also not interested in flogging a 750 lb. bike around too often, I would have kept my gixxer! -I personally love the looks of the bags, are top loading and are quite large. -Overall I like the looks of the entire bike but that is obviously subjective. I do like the fact that it is unique. -Small dealer network but I do have the best in Jim Hamlin! -Not the best gas mileage. By the way I am the thirteenth left in the country that likes to change oil and adjust valves! Bulldog9, If I were you I would dig up another 3G and buy that beautiful like new 2017 Touring that Kballowe is selling! I like the idea of the Cal 14 Touring. I wanted to love the one I test road a while back. But I found the ergonomics awful and cramped compared to my Victory Cross Country Tour. The bikes have a very similar wheelbase but I'm not sure where Piaggio lost so much of the wheelbase in their ergonomic layout. Plus I felt like I was nearly sitting on the tank with the bars too close to my chest. The wide /short tank of the 1400 series also needs to be redone IMHO. I'm still in love with the overall aesthetics of the Eldo 1400. The more I see the all black one the more I lprefer it over the two tone red and black version. If my wife were to call it quits as a passenger I'd very likely get myself an Eldorado 1400. Then ensure I added a few of the Cal Touring amenities like a windshield and running lights. The spoked tubeless wheels with the wide whitewalls on the Eldorado are IMHO, a perfect match for the bikes overall design and intention. Yes, I know, the Moto Guzzi dealer network is nearly AWOL. That doesn't bother me much as it does most potential Guzzi customers. I seldom use a dealer for anything but tire changes anyway. It's sad though that a dead brand like Victory has so much more of a dealer network than a current brand like Moto Guzzi. For the US market, I still think Moto Guzzi needs a larger displacement 'big brother' model series added to the lineup. As was posted above, big twins are loved for their big torque. The brands that Moto Guzzi could (and should) compete with all have models from small to large. With Moto Guzzi going from 750 to 1400, they're missing out on the 'large' displacement/big torque segment. And PLEASE, can someone at Piaggio design out the 1400 vertical line that keeps the front half of the bike from being fully integrated with the back half. That and redesign the exhaust system to stop it from looking like an erector set of assembled parts instead of flowing gracefully from the heads to the exits. There's at least one too many seems going on with the exhaust covers. Firstly I will commend Guzzi for trying something different with the tank and the cutout for the cylinders, and apparently some people like it. I wanted a Guzzi California for years, as it turned out buy the time I was in a financial position to buy a new one they had changed to the current styling. As much as I have tried I just can't grow to like the look. Also I don't want to be hypocritical and condemn the Moto Guzzi California for putting on a bit of weight as it has gotten older, but the blow out from 250 odd kilograms to 322 kilograms was a bit much for me. That is almost a 30% increase in weight. I am sure my wife would comment if I waked on an extra 30% weight. I fully accept that the look and size is appealing to some customers, just not me so I spend my money elsewhere. I was hoping the V9 would take the place of the old California but for me they missed the mark with the 15 liter tank and a seat that looks like it was made for a different bike. With a bit of work the V9 could be turned into something that looks more integrated and practical, but if I am buying a new bike I don't want to have to redesign it. I’m glad my dealer isn’t worth a stale bottle of piss. Were it not the case, I never would have met Roper. Encyclopaedic knowlege and a human being as well, who’da thought that to be possible? It did not occur to me that the high revving motor and the torque/hp curves were problematic in the segment. thanks KevM for that insight. I cut my adult teeth on a Honda Valkyie flat 6, then straight to various Guzzis. one of my first comments after testing the other bikes in segment is consistently that they don't have enough rpm range to satisfy the soul. i spend a lot of time riding in the mountains of NC, both solo and 2up, and it is supremely satisfying to stay in the 3500-4500 range where the power and the roads really become one to stir the soul. Perhaps if i had an equal amount of experience with torquey low revving motors i would not think that everyone else is missing out and that i (we) have found the Holy Grail of motorcycle engines. But, i doubt it now that i've been edumacated. We tend to look at all of life through our experiences, and the same is true of motorcycling. My experience is largely Guzzi, so other bikes engines are compared to all motors guzzi style. as someone said above, niche of a niche of a niche. the niche of my motorcycle experience by definition does not lock step with the masses.